Soon enough, every parent will have to discuss online safety with their children. 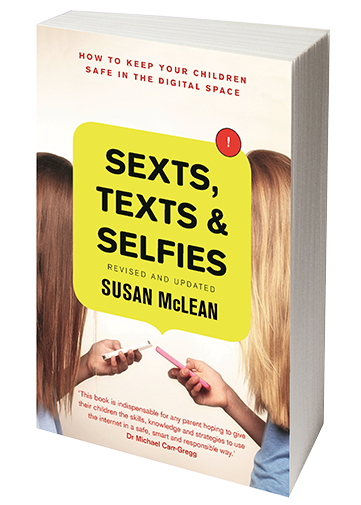 Sexts, Texts and Selfies is your salvation. It will help you understand and connect with your child’s online world, and guide them safely through it. Purchase Sexts, Texts and Selfies $30.00 + $8.00 P&H within Australia. Purchase Sexts, Texts and Selfies $30.00 + $19.00 P&H to Asia/Pacific region. Purchase Sexts, Texts and Selfies $30.00 + $25.00 P&H to UK and EU countries. Purchase Sexts, Texts and Selfies $30.00 + $20.00 P&H to the U.S.A.